I have used a Solar Parabolic Cooker for several years now, and know that safety is a necessary precaution with any instrument designed for cooking with high heat and temperatures. Despite knowing all of the safety measures and precautions for the safe use of a parabolic, I left my Solar Burner Parabolic on the back patio turned away from the sun, but up close to our stucco back wall, thinking that it would be safe and fine there for a while. 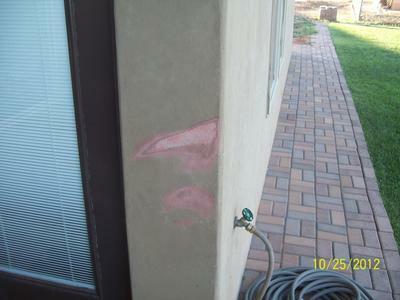 When I finally returned to the back patio after a few hours I found etched into our tan stucco two moon shaped, bright red spots where the stucco had been burnt out. And when you passed your hand over the burnt areas the stucco fell like fine dust to the ground. The off-angle of the parabolic still allowed for a focal point to form and to create enough heat that it caused our stucco to burn. I also made the same mistake about a year earlier with a small parabolic that I was transporting inside of our van. I supposed that inside of the van and with the windows blocking most of the UV rays that I would not have to worry about covering the dish of the parabolic. 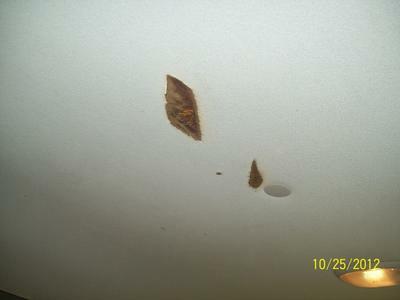 Luckily I smelled the burning ceiling material before it could do too much damage. I have the photographic evidence of my negligent actions to be able to show others "what not to do" with a parabolic cooker. It seems to me I read an account of a US not-for-profit project to provide parabolic cookers for villagers living around Lake Titicaca in South America. Might have been a project at Brigham Young University in Utah, but that bears checking - its been a few years. Probably almost 20. As I remember it the project intended to replace the small wood fires traditionally used for cooking. Cooking over fires required increasingly scarce firewood (a significant cost to people living at subsistence) and, in unventilated homes a common cause of respiratory disease and cancer for women especially (as they do most of the daily cooking). The parabolic cookers appeared to be a hit, but after cooking too many people simply propped their dishes against the side of the house, and the resulting house fires led them to reject the new too-dangerous appliances. The organization behind the project replaced the dishes with box cookers instead. I gather this was seen as a success. If someone out there can remember the project and has better info (again, this is from memory, & mine feels pretty sketchy) perhaps they can document it for us. I'd be interested in how well the project worked in the long run. Traditional indigenous communities in the third world are often pretty resistant to cultural change, not just because because of cultural inertia, but often for very significant practical reasons we may overlook or simply not understand. The use of solar box cookers might require a huge change in traditional cooking practices. I have watched a woman in a stick shack in the Mexican jungle cook corn-flour chipaties on a smooth hot rock in a tiny stick fire, in a stick one-"room" shack. They don't have fry pans. So while a parabolic solar cooker looks like a pretty close analogy to cooking over a fire to you & me, it requires utensils they don't necessarily have: they lack frypans, pots, utensils, and the means to purchase them. A switch to box cookers is worse. With a solar cooker they'd need pots, and more importantly, new recipes and perhaps a change in their food staples. That's a lot of change. And a change in when & how long in advance they have to start cooking. So again, I wonder how it worked out in the long run. I know it can work: solar cookers and parabolic dish cookers are in widespread use across India and rural China. Anyone know more about South America? And yes it should be used with care, just as one would do so with fire, gas and electricity. We feel that if one is educated in the proper care and use of a tool it is of great benefit to the user of it. We have taught all of our children how to safely use a parabolic cooker and our other solar cookers. By the way, we will soon be introducing our outdoor, weather proof parabolic and Sun Oven covers. The parabolic cover will be especially useful because it will help prevent any possibility of a dangerous stray focal point when the unit is not in use. We encourage all to watch for these new covers. I left my Solar Burner outside, pointed well away from the sun, and came out a hour or so later, only to find that it had melted areas on two large plastic garbage bins that were standing near it. Since that time, I ALWAYS store the Solar Burner in a fully shaded area when not in use. It is a powerful tool, and must be treated with respect. Join in and write your own page! It's easy to do. How? Simply click here to return to Solar Cooking Humor.